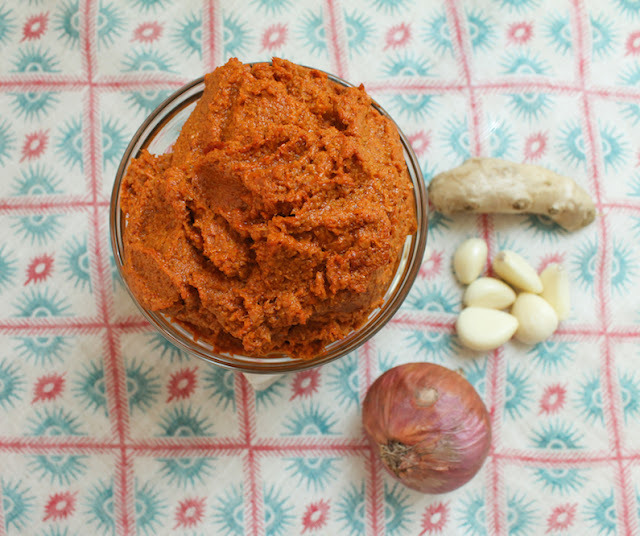 This Burmese curry paste recipe is the spicy base for all chicken, fish or vegetable curries, according to my Burmese friend, Ma Toe, an excellent cook. It makes enough for three pots of curry so you make it once and freeze the balance. A brilliantly efficient way of cooking. 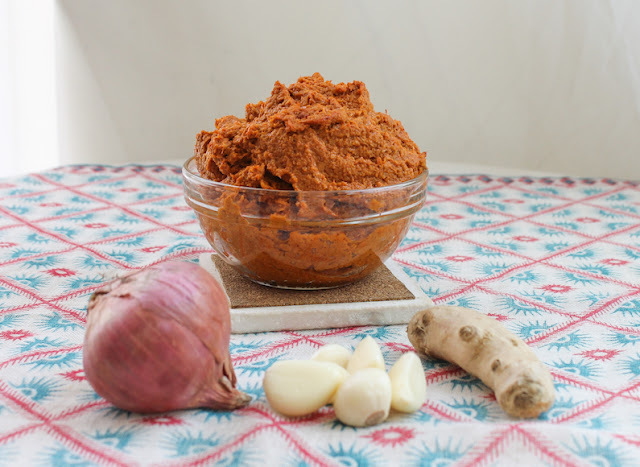 Burmese curry does not use spices, just a paste made of onions, garlic and ginger, cooked until fragrant and then reddened with cayenne and paprika or annato. For chicken curry, you add cinnamon sticks when cooking. For fish curry, you add tomatoes and lightly crushed lemon grass stalks. 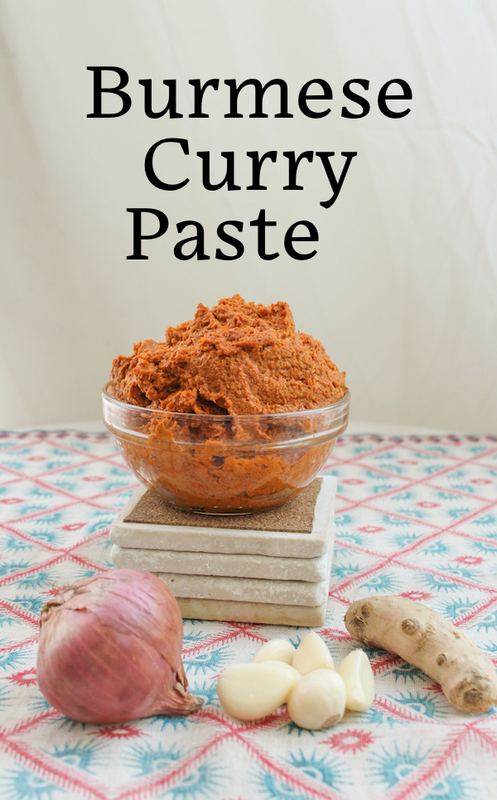 I love using this curry paste for a hybrid Indian/Burmese potato curry as well. The sauce is the best! Peel your garlic or buy fresh already peeled. Do not use garlic paste or chopped garlic in a jar. They have other ingredients to keep the garlic from discoloring which add a weird flavor. I spread newspaper on my coffee table and watch TV while I peel. Goes quick. Peel your ginger and chop it finely. Peel your onions and chop them into quarters or eighths. It may not all fit at once so put what you can and blend for minute or two then add in the rest. Blend until you have a smooth paste, turning the blender off and pushing the bits down occasionally. Heat up a little more canola oil in your pot and then pour in the paste. Cook and cook and cook, stirring occasionally. It turns green as you cook it which is pretty cool, since you put nothing green in there. I don’t know why that always fascinates me. Like magic. Once I asked Ma Toe how to know it was ready and she said, “When it doesn’t smell like onions anymore.” I’d say about 20-30 minutes will do it. Now add the cayenne and paprika (or annato.) Cook a little longer and stir thoroughly until the color changes. Now we are looking more like curry! If you like spicy, you can add even more cayenne. This is going to be enough paste for three pots of curry so let it cool a little. Save it divided in three bags and pop it in your freezer. 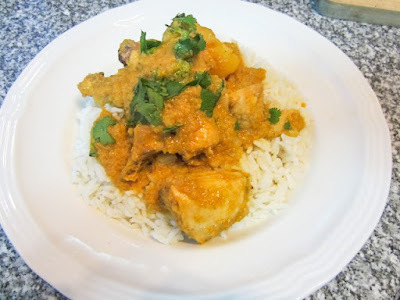 Check out my Burmese Chicken Curry recipe here! And coming up this Friday, I'll be posting my Burmese Fish Curry recipe too. Stand by!